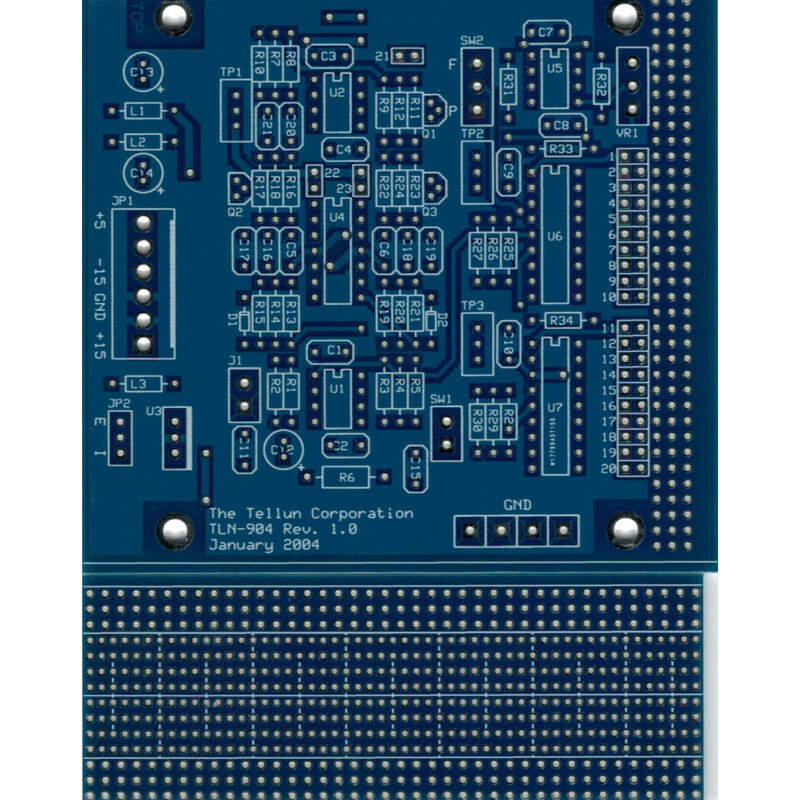 The Multi-Use Universal Buffer (MUUB) is a general purpose daughterboard that can be used to add additional circuitry to MOTM, Oakley, Blacet, or almost any synthesizer module. The MUUB printed circuit board (PCB) has provisions for a four-pin MTA-156 power connector, ferrite beads, and bypass capacitors for powering your circuit. The remainder of the board contains space for op-amps, resistors, capacitors, trimmers, diodes, and wire pads. The MUUB PCB is available in three configurations: MUUB-2 has space for one dual op-amp; MUUB-4 has space for two dual op-amps; MUUB-3 has space for one dual op-amp and a general purpose area with six uncommited power busses and plenty of plated through holes for additional circuitry. MUUB is a group effort by Richard Brewster, Larry Hendry, and Scott Juskiw. The DB-120 is a daughterboard for the MOTM-120 Sub-Octave Multiplexer. The DB-120 adds individual outputs for the four sub-octaves, a staircase wave that is the binary weighted sum of the four sub-octaves, and a switch for selecting either AC or DC coupling for the staircase wave and the signal appearing at the MOTM-120 OUTPUT jack. The four sub-octave outputs are DC coupled square waves that swing between +5 volts and -5 volts. Total current draw for DB-120 and MOTM-120 is 35 mA @+15V and 26 mA @-15V. Circuit design by Richard Brewster. The DB-320 is a daughterboard for the MOTM-320 Voltage Controlled LFO. The DB-320 adds inverted outputs for the four LFO waveforms. A header is also provided for connecting the RANGE switch on the MOTM-320R panel. Total current draw for DB-320 and MOTM-320 is 63 mA @+15V and 57 mA @-15V. Circuit design by Larry Hendry. The DB-800 is a daughterboard for the MOTM-800 EG. The DB-800 adds a comparator to the GATE input and a clipper to the output of the MOTM-800 EG. The MOTM-800 requires a relatively fast rising signal at the GATE input to generate an envelope. Slow rising signals, like the SINE output from an LFO, will not normally trigger the MOTM-800. The comparator squares up any signal at the GATE input so that any voltage rising above +1.4 volts will trigger the EG. Two optional LED drivers are also provided, one for the GATE input and another for the EG output. Total current draw for DB-800 and MOTM-800 is 36 mA @+15V and 16 mA @-15V. The TLN-428 is a state variable filter built around a Curtis Electromusic Specialties CEM 3320 chip. Four simultaneous outputs (all with two pole response) are provided: low pass, high pass, band pass, and notch. A built in mixer allows for two audio inputs. The filter frequency can be set using a panel mounted pot, a "one volt per octave" external control voltage, or via two external FM inputs with attenuators (one reversing). Filter resonance can be set using a panel mounted pot or an external control voltage with a reversing attenuator. Total current draw for TLN-428 is 20 mA @+15V and 23 mA @-15V. The TLN-442 is a four pole low pass filter built around a Curtis Electromusic Specialties CEM 3320 chip. A built in mixer allows for three audio inputs. The filter frequency can be set using a panel mounted pot, a "one volt per octave" external control voltage, or via two external FM inputs with attenuators (one reversing). Filter resonance can be set using a panel mounted pot or an external control voltage with a reversing attenuator. A four pole low pass filter built with a CEM 3320 was used in the Sequential Circuits Prophet Five (rev. 3) and Pro One synthesizers. Total current draw for TLN-442 is 12 mA @+15V and 15 mA @-15V. The TLN-712 Doomsday Machine is a voltage controlled waveform animator for modular synthesizers. Originally conceived as two separate modules, the TLN-712 comprises two different animation circuits and four voltage-controlled LFOs (low frequency oscillators). The first animator (Thalaran Radiation Emitter) is based on the Multi-Phase Waveform Animator by Bernie Hutchins. The second animator (Cascading Biogenic Pulse) is based on the Pulse Width Multiplier by Craig Anderton. Both animators have been combined into one module along with four LFOs to create a self contained system that makes optimal use of panel space. All you need to add is a single oscillator and a few patch cords to create a marvelous mayhem of sonic madness. Add a second oscillator and you'll never get a date to the prom. Four modulation sources. Each source has an OFFSET pot to set the initial modulation point, a MOD input jack with attenuator to allow for external control of modulation, and an internal LFO. All four modulation sources are internally connected to both animators. Each internal LFO has a RATE pot, an LED to provide visual indication of the rate, and a DEPTH pot to set the amount of LFO fed to the animators. Each LFO has a 10 Vpp triangle wave output that is available for external use. Internally, each LFO provides a sine wave to the two animators. The rate and depth of all LFOs can be changed en masse using the EXT RATE and EXT DEPTH jacks and attenuators. Use these with a keyboard control voltage, mod wheel, or foot pedal to control both the speed and depth of animation. The Thalaran Radiation Emitter has one input jack (IN A) and three output jacks (SAW, TRI, STEP). A sawtooth wave is normally applied to IN A, but sine or triangle waves can also be used (almost any waveform except pulse waves will produce some kind of useful output). With a sawtooth input, the SAW output comprises the input signal plus four phase shifted versions of the input signal (sounds like five sawtooth waves). The phase shift is controlled by the four modulation sources. The TRI output provides a similar effect but with five triangle waves. The STEP output is a bizarre staircase waveform where the depth of each step is controlled by the four modulation sources. The Cascading Biogenic Pulse has two input jacks (IN B and AUX) and four output jacks (PULSE 1-4). A triangle wave is normally applied to IN B, but sine or sawtooth waves can also be used (almost any waveform except pulse waves will work). The four PULSE outputs produce an intense pulse width modulation (PWM) effect with single, double, triple, and quadruple pulses appearing at outputs 1-4 respectively. Think of it as PWM on steroids. The PWM effect is controlled by the four modulation sources. The AUX input can be used to provide an additional level of animation, or to cascade two TLN-712s to get even more intense PWM, or to provide a cross-product effect. All inputs and outputs are DC-coupled. Either animator can be used to produce strangely wonderful waveforms for modulating other signals. The Cascading Biogenic Pulse can even be used to generate rhythmic gates and triggers. The TLN-854 Sword of Kahless is an amalgamation of a Doepfer R2M Ribbon to MIDI Interface and an unreleased ribbon controller I built for myself in early 2005. The R2M has some nice features (programmable, pitch quantization, no droop, MIDI in/out, position and pressure sensor) but is rather weak in the analogue control voltage section with only two outputs (position and pressure) and one gate output (position only). The TLN-854 remedies these limitations by using the R2M as the core of the ribbon controller and adding a substantially enhanced analogue output section (see feature list below). The R2M is itself not modified, merely enhanced, and thus all of its features are still available. You can download the R2M User Guide from Doepfer, but be warned that the section describing the analogue control voltage section is not correct; they need to update it. 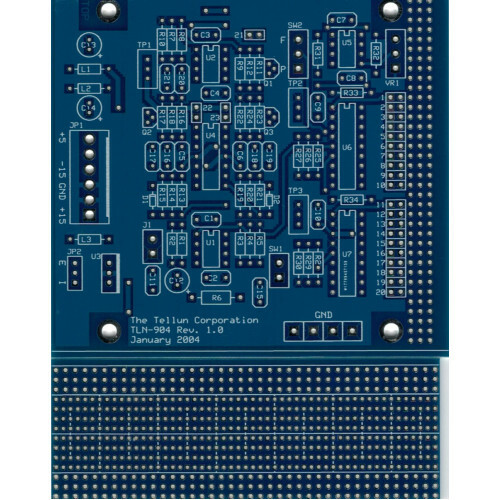 In order to build this module, you will need: an R2M from Doepfer (including both the control box and the manual), the TLN-854 printed circuit board (and all necessary parts, see the User Guide for details), and a suitable panel. The R2M is mounted behind the top part of the panel using threaded standoffs epoxied to the back of the panel. The TLN-854 PCB is mounted behind the panel using Stooge brackets. You may also want to consider repackaging the R2M manual into a proper Bat'leth worthy of the warrior within you. Do a search for Bat'leth or Klingon weapons and you'll find plenty of fine examples. Total current draw for TLN-854 and R2M is 81 mA @+15V, 30 mA @-15V, and 48 mA @+5V. The TLN-904 Veeblefetzer is a signal level meter for modular synthesizers. This module produces no sound; it is used to indicate signal level (voltage level) for both audio and control signals. I built this module because I got tired of hauling the scope over to my synth every time I wanted to check the level of a signal, or to figure out if a signal was bipolar or unipolar. It also provides lots of blinkenlights to mesmerize anyone who comes within visual range of your synth. A 10 segment LED display driver for positive voltages (typically set for half volt increments from 0.5V to 5.0V). A 10 segment LED display driver for negative voltages (typically set for half volt increments from -0.5V to -5.0V). A zero LED driver for voltages that are too small to register on either the positive or negative displays. An adjustable positive peak detector LED driver. An adjustable negative peak detector LED driver. Two jacks on the front panel make it easy to hook the Veeblefetzer into a patch without having to use a multiple. The MODE switch selects either BAR or DOT mode on the two 10 segment LED display drivers. The RANGE switch selects either a FIXED range for the two 10 segment LED display drivers (typically -5V to +5V) or an adjustable range that follows the PEAK knob setting. The adjustable range mode would be used to zoom the display out for viewing 20Vpp signals or to zoom the display in for viewing 1Vpp signals. The PEAK pot sets the level of the positive and negative peak detectors: 0V to +10V for the positive peak detector, 0V to -10V for the negative peak detector. This control also sets the range of the two 10 segment LED display drivers when the RANGE switch is set to PEAK mode. Total current draw for TLN-904 depends on the number of LEDs, the type of LEDs, and how the LEDs are powered. For the example shown at the bottom of this page (using 25 high brightness LEDs powered from an onboard +5V regulator) the maximum current draw is 50 mA @+15V and 14 mA @-15V.